Last month, Dr. Sij Hemal was settling in to a transatlantic flight on Air France. He'd just attended his best friend's wedding in New Delhi, India and was beginning the Paris-to-New York leg of his day-long journey home. 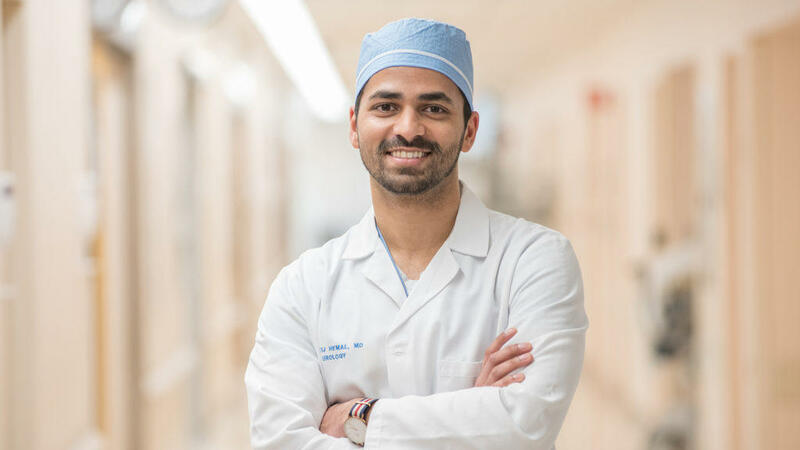 Hemal, a second-year urology resident at Cleveland Clinic's Glickman Urological and Kidney Institute, was seated next to a French pediatrician – by total coincidence – and was watching a movie and awaiting a glass of champagne. "I was pretty tired from jet lag," Dr. Hemal recalled in a post on Cleveland Clinic's website. "I thought I'd just have a drink and fall asleep. As it turned out, I'm glad I didn't drink anything." It's safe to say fellow passenger Toyin Ogundipe, a 41-year-old banker who resides in both the U.K. and Nigeria, feels the same way. She went into labor midway into the flight. The plane was passing the southern coast of Greenland at the time, and making an emergency landing would require a two-hour diversion to a U.S. military base in the Azores Islands. Hemal volunteered to assist Ogundipe and recommended the pilot stay the course to JFK International Airport, still a few hours away. "Her contractions were about 10 minutes apart, so the pediatrician and I began to monitor her vital signs and keep her comfortable," Hemal said. He and the pediatrician, Dr. Susan Shepherd, suggested moving Ogundipe up to the first class section where there was more room and fewer passengers. "My ticket to first class!" he quipped. While flight attendants took care of Ogundipe's 4-year-old daughter Amy, the doctors checked their patient's vitals, including blood pressure, oxygen rate, and pulse, using the limited tools in the plane's medical kit. Within an hour, the contractions accelerated and it became clear the baby would be delivered on the plane. Though Hemal had delivered seven babies during medical school, this experience was certainly a first for him. "We're trained to stay calm and think clearly in emergency situations," he said. "I just tried to think ahead to what might go wrong, and come up with a creative solution." As for Ogundipe, she remembers being composed throughout the delivery, thanks in part to the calming manner of the doctors. "I was relaxed because I knew I was in safe hands," she said. "They did everything a doctor or midwife would have done if I was in the labor room in the hospital. Even better, if you ask me." Thirty minutes of pushing later, she gave birth to a little boy whom she named Jake. Jake seemed healthy and soon began nursing. When the plane landed at JFK, Ogundipe and her children were taken to a nearby hospital for a checkup. They were released later that day. Hemal made the last leg of his journey, a flight to Cleveland, which was thankfully uneventful. He still stays in contact with Ogundipe and Shepard. "So much could have gone wrong, but it didn't. Being on that particular flight, sitting next to a pediatrician … it's like it was destiny," he said. "Thanks to God, everything worked out."